One of the best ways to add dimension to your hair is through highlighting. Rather than going for a solid new color, many women opt to enhance their natural color with a different shade to add texture. Highlights are colors that are lighter than your hair’s natural color, and lowlights are darker. Foiling is one of the most popular and effective highlighting techniques. 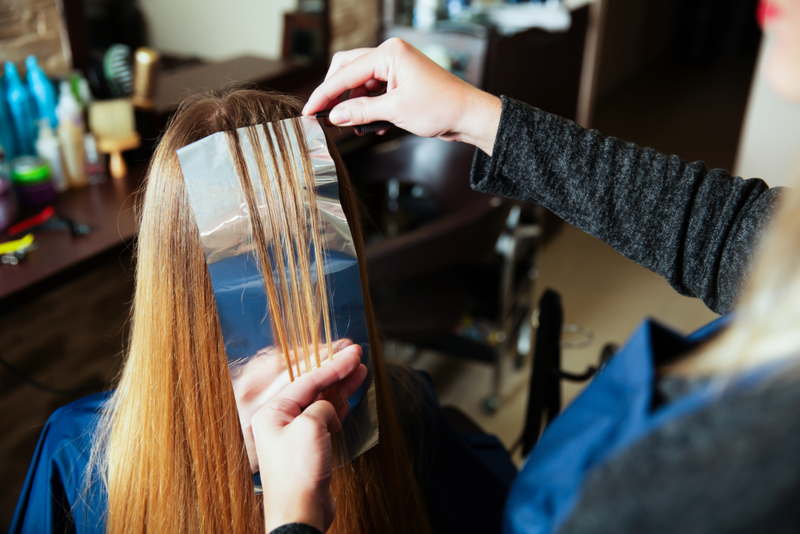 The process uses special papers, or foils, to isolate the portions of hair that will be colored with the different shade. Your stylist selects which groups of strands to color, and these are sealed inside the foils along with the coloring. Because they are inside the papers, your natural hair surrounding these strands are not colored. One advantage to foiling is that your stylist can precisely select which hairs to color and which to leave natural, creating exactly the effect that the stylist intended. The coloring is uniform, and your stylist can even use your own natural color as the highlight or lowlight. Because the technique gives your stylist control over the results, foil highlighting is very versatile. It can be used to create a bold look with strongly contrasting colors or one that is subdued and natural-looking. Foiling also allows the stylist to apply the color close to the scalp on the selected strands. Foiled highlights last for several months, although touch-ups may be needed every several weeks, depending on your style. To keep your color looking great, always use hair products that are recommended by your stylist. Ready to add some dimension to your color? Make an appointment today at Untangled Salon. Our professional stylists know how to make you look your best and will help you choose the right color to suit your individual personality! You can find us at 19924 Jetton Road, Suite 105 in Cornelius. To schedule an appointment, give us a call at 704-895-9300 or email us at info@hairuntangled.com. Prefer to schedule an appointment yourself? Use our free mobile app. You can download it for free at the AppStore, on Google Play, or Amazon.